When it was time to transition Essley over to solid foods, I was slightly terrified. I'd exclusively breastfed for six months, and while some of my friends had started introducing rice cereal and some purees at four months, I'd decided to wait until her half birthday. When the time approached to finally give her something other than breastmilk, I'd gotten pretty used to feeding her just one way. So the thought of changing something with which we'd both gotten so comfortable scared me. I was worried that I'd somehow screw up and like, cause her to projectile vomit or invoke some sort of instantaneous deadly food allergy. I was also a little concerned that making her food myself would be a massive time commitment. I'm almost embarrassed to admit how many times I Googled 'baby's first foods' before finally making the leap, but ultimately, it ended up being a great experience. 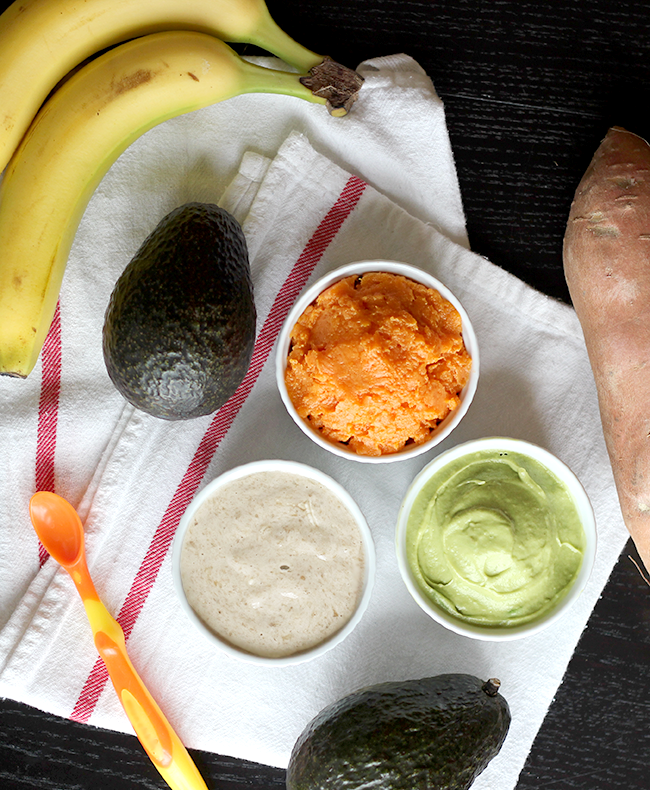 We decided to go with a homemade avocado puree, and lucky for us, Essley loved it. I mean loved it. She was stoked. And I was instantly hooked on making our own baby food. It was inexpensive and incredibly easy, and even at almost 16 months, Essley still eats these purees (and their chunkier, hand-mashed toddler versions) on the regular. 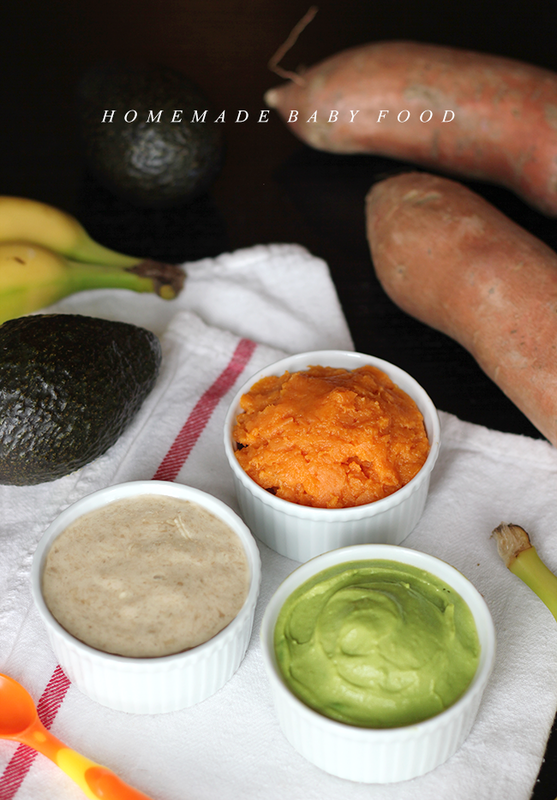 So today, I thought I'd share easy recipes for her first three solid purees: avocado, sweet potato, and banana (which she tried in that exact order). 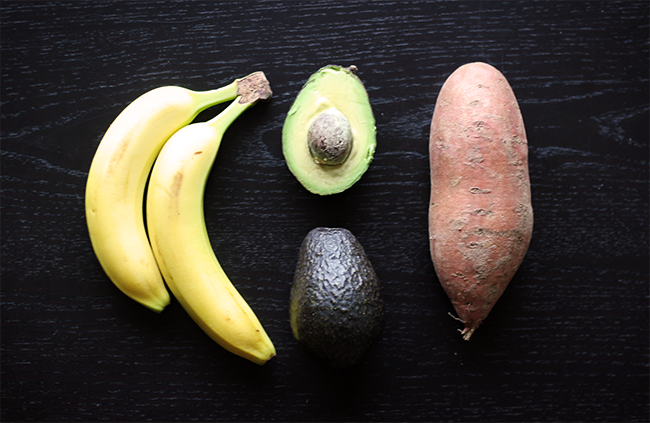 All three of these foods are very nutritious and ideal first solids for baby. Before you feed your baby solids for the first time, there are a couple of things to note. First, you should offer single ingredient foods, and wait five to seven days before offering a different food. This way, if you see any sort of reaction, you'll be able to know which food caused it. It's also best to avoid seasonings and salt at first. 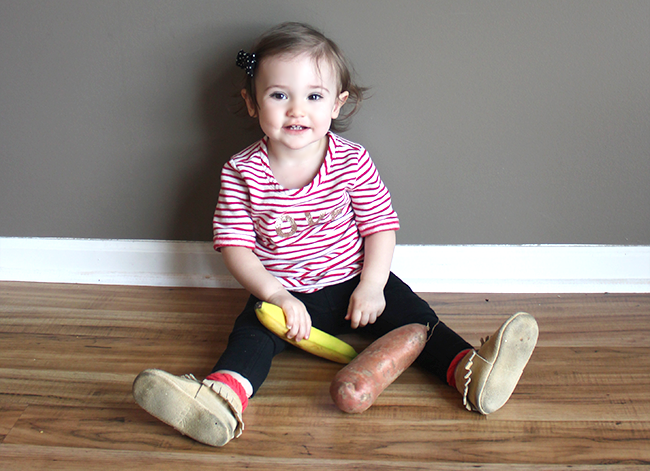 Once you're aware of what foods your baby can tolerate, you can start mixing. (Essley loved - and still loves - the avocado and banana purees mixed together.) And once your baby is older enough (usually around ten months), you can follow these same recipes but just use a fork to mash instead of pureeing them. The other thing is that it's a good idea to add breastmilk or formula (whichever your baby is accustomed to eating) to purees for a while, in order to make the transition easier on your little one's stomach. It also makes the purees nice and creamy, which is a bonus. Choose a ripe avocado (they're soft when ripe), slice down the middle (length wise) around the pit, then remove the pit (but don't discard). 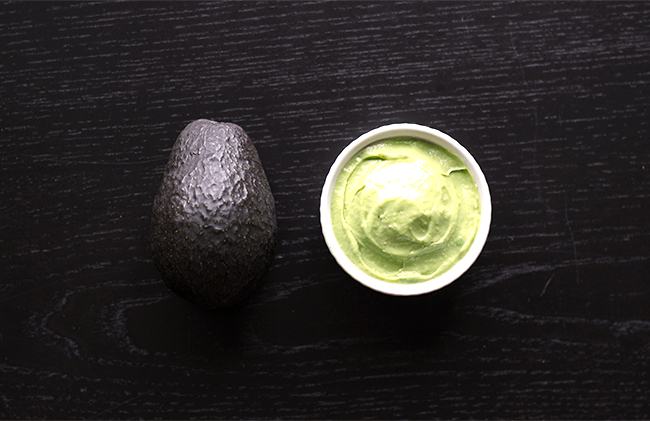 Use a spoon to scoop out the flesh of the avocado, and place the flesh into a blender or food processor. Add a small amount of breastmilk or formula, and puree. Continue to add more breastmilk or formula until you reach the desired consistency. Store any leftovers in the refrigerator with the pit (which will help to keep it fresh) for up to 48 hours. Preheat your oven to 400 degrees. Thoroughly wash your sweet potato, and prick several times with a fork. Bake for 45 minutes to an hour. (You want it to be nice and tender.) Remove from oven and allow to cool. When cool enough to handle, cut open, and use a spoon to scoop the flesh into a blender or food processor. 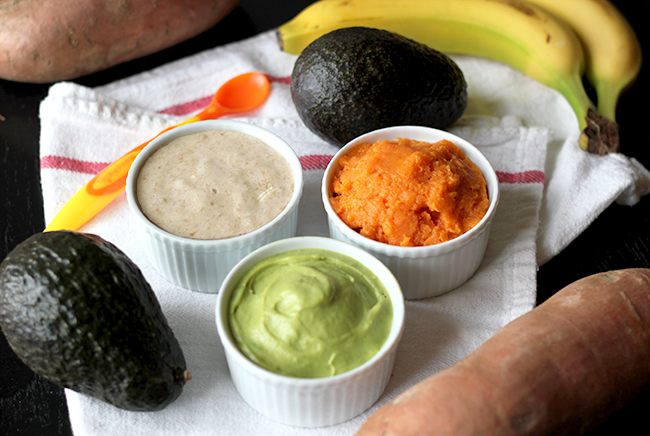 Just like with the avocado puree, add a small amount of breastmilk or formula, and puree. Continue to add more breastmilk or formula until your desired consistency is reached. 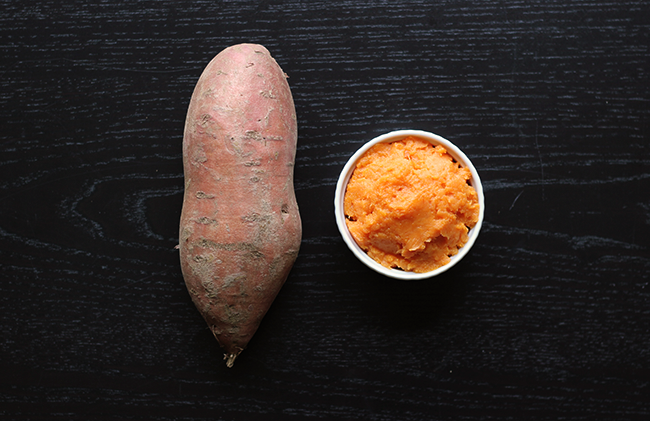 Store leftovers in the refrigerator (one sweet potato makes a lot of puree) for up to 48 hours. This one is the easiest of all. 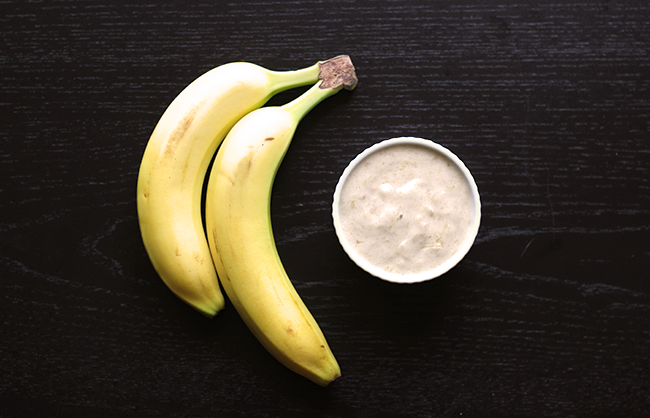 Peel the banana, add to the blender or food processor, add a small amount of breastmilk or formula, and puree. As with the others, continue to add more breastmilk or formula until your desired consistency is reached. Banana puree doesn't keep very well, but if you have some leftover, you can freeze it, then thaw before feeding, or serve as an 'ice cream' if your baby is old enough to tolerate it. While we're on the subject of how we feed our babies and toddlers, I'd also like to quickly introduce you guys to a campaign with which I'm working over the next few months, aptly named the Sisterhood of Motherhood. (I'm sure many of you have seen the equally hilarious and tear-inducing video/commercial that started it all. If you haven't, you can watch it right here.) As I mentioned above when discussing our personal story with transitioning to solids, my feeding journey with my daughter has been one of solely breastfeeding (we've never used formula, and we are still nursing once before bed and sometimes once in the morning at almost 16 months). I have many close friends, however, for whom formula has been a successful, nurturing means of feeding their babies. And we are supportive of one another in how we feed our children, regardless of the means, because we are each motivated by what is best for our kids. This sort of encouragement of our fellow parents is exactly the premise of the Sisterhood of Motherhood, and the reason for which I wanted to be a part of it. Although I've been lucky with my close group of friends, this type of nonjudgemental support when it comes to little ones and feeding (or sleeping arrangements, or potty training, or rule making, or countless other parenting situations), can be a rarity. It seems that almost every parenting choice is a target for scrutiny. And I've definitely been judged myself. In fact, I've specifically talked here before about how one of the biggest lessons I learned (the hard way) in my first year of parenthood was that criticizing other parents' methods or choices for being different is way more common than it should be. I also confessed that I used to judge parents myself, mainly because I had created an idea of what was right and what wasn't. Then I actually became a parent, and we started to go down different paths than initially planned, and as a result, I started to worry about what other parents would think. That sort of insecurity where there should have been feelings of being supported and encouraged by other parents ended up being a good thing though - because it eventually taught me that there simply isn't one right way. I learned that it doesn't matter what anyone thinks about my (or anyone else's) parenting, and that there is only what works best for each child, each parent, and each family. I've also learned that there is absolutely no reason that moms/dads who parent differently from other moms/dads can't maintain strong, nourishing friendships. As I've said before, I strongly feel that if someone is doing their best to be a genuinely good parent and someone else chastises their methods because they're different, that's really too bad - because if we all encouraged one another, regardless of parenting techniques, parenting would likely be collectively easier for everybody. This is exactly why I felt connected with the Sisterhood of Motherhood and chose to get involved. I haven't gotten too into specifics here on the blog in terms of the parenting choices we've made personally for our family (and/or the things that have had to be altered because they haven't turned out as planned) - especially in regards to more sensitive parenting subjects. But I will be choosing to share some bits and pieces of this throughout the campaign, because I truly feel that it's important for all of us to be able to be open about how we parent without fear of judgement (if we feel comfortable sharing, of course). So along with fun stuff (like getting to share Essley's first food recipes here! ), I'll also be talking a little more about my personal parenting journey in future Sisterhood of Motherhood posts. I'm really looking forward to it, and to helping promote a positive message in regards to different choices when it comes to parenting. For those of you with babes, which solid foods did you try first? And on the subject of encouraging one another as parents, do you have any stories of how you felt supported (or supported others) in their parenting journeys? I'd love to hear them! I actually had no idea there was so much judgement in parenting choices until I started blogging and thus spending too much time on the internet. I think having a supportive network for moms is probably a really good idea. All moms are just trying to do their best, and it's kind of nuts when people think there's only one "right" way to raise a child, or give birth, and everything else is wrong/terrible for the child. It's just not true. I just sent this link to my sister who has a 3 month old and was just talking about being scared about moving to solids in a few months! I love what you write about parenting and judgment too and I know my sister will be excited for your upcoming posts. I saw that commercial during the superbowl too and it made me cry!! All of the purees sound amazing and I'm glad Essley likes them! I know from my friends with kids how judgmental some parents can be, but usually those people are judgmental of everything, not just raising kids. The Sisterhood sounds like an amazing program! I think that's a great point Duni. I agree that most judgmental parents I've come across are either just judgmental in general, or don't understand. I know now that before I had Essley and I'd find myself getting judge-y about parenting, it was because I didn't realize that there wasn't one right way of doing things. It is an amazing program. :) I'm stoked! We did avocado for Ava's first food too! I've heart sweet potatoes were great too so thank you for the recipe. I'm looking forward to your posts in this campaign, it sounds really cool. Essley is obsessed with sweet potatoes. Definitely try them! Thank you Anna! We eat the sweet potato puree all the time and now that Essley is easting chunkier food, we make guac from the avocados. I've been a bit slow in introducing foods associated with latex (bananas, avocado) to my LO because my husband has a bad latex allergy. At 14m I finally gave him banana and he loved it - with no issues. I will have to try your purees because we've seem to gone back to them as we are currently cutting 4 molars and solid foods are not pleasant to chomp on. It's been a long time since I was involved in baby-feeding (the 1970's), and I was unable to breast feed at all. However when it came to the first solids, I decided to make use of that wonderful invention, the blender and indeed it was bananas that formed the first one. However, because we didn't want "picky" eaters in our family, I used to blend the ingredients of what my husband and I ate for our main meal each day. Thus little one got used to the taste of meat and veggies (including those "difficult" ones - cabbage, brussels sprouts an such like) so the transition to "real food" was not as problematic as I know it can be. There were tantrums, but that's life. I found it worked very well - and saved a small fortune in purchasing the manufactured varieties. Good luck!